<= Can you identify this mad bird? It also has a yellow rump! 1) Saturday, June the 17th: A visit to N.C.C. Burr Oak Savannah. This outing was originally planned for Sunday the 11th of June. However, N.C.C. has cancelled the Sunday activities. Meet at 10AM at gate # 14034 on Hwy 540 between Gore Bay and Evansville. Bring lunch and bug spray. 2) Saturday, July the 8th: A visit to Christina Bay. Hardy members may be able to hike the shoreline to the east to the E.B.C. property of Green Point. Meet at the General store in Silverwater at 930AM. Meet at 4PM at McLean’s Park on Hwy 6 . Picnic tables and a walking trail in the hardwoods are its features. Bring chairs and food for the potluck . Meet at 10AM at the junction on Gibraltar Rd. and Hwy 542.We shall visit Dave & Nancy Kains' property with Dr Freeman Boyd to look for mushrooms. Hope to see you there……….. Have a great summer!!!! 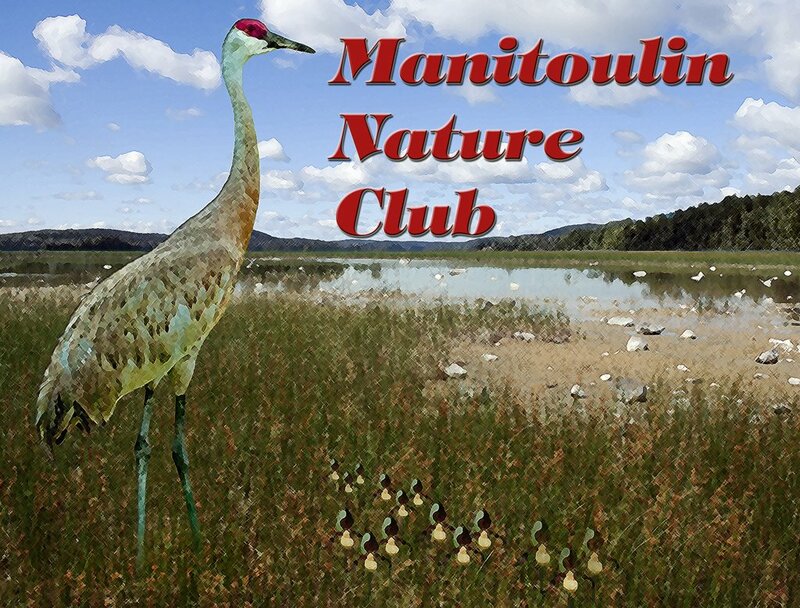 The Manitoulin Nature Club was formed in 1979 with 6 members as a nucleus. Mrs. Jean Williamson was the organizer of this group and is still an active member to this day. The Club was created to establish knowledge of nature in all its forms and to support the preservation of these elements of natural history many of which are unique to Manitoulin. The Club became affiliated with Ontario Nature (Federation of Ontario Naturalist) soon afterwards and currently attends meetings of the Northern clubs of Ontario. The club provides information to certain organizations including Manitoulin Planning board (wetlands), The Nature Conservancy of Canada (points of interests on Manitoulin) and Parks Ontario (Management Planning Board). Donations have been given to aid in the preservation of the Alvar of Quarry Bay, now a Nature reserve and to N.C.C. for the preservation of a Bur Oak savannah.Club members participated in the recent 5-year project of the Ontario Breeding Bird Atlas and provided data for the entire Island of Manitoulin including the offshore islands. The Club holds meetings at the Child Care Center in Mindemoya on the last Friday of the month from September to May with the exception of December. Speakers on subjects of interest are invited to these meetings. Outings are organized for the months of May to September inclusive to interesting places on and off the Island. • Victoria Day weekend bird-a-thon: we look for spring migrants during a tour of birding spots. There is camping over night at Meldrum Bay Lighthouse. • October Sandhill Crane count: We tour the Island on A Saturday in late October looking for the Cranes when numbers may reach 2000. • Christmas Bird Count: the count happens late in December, Saturday in Mindemoya and Sunday in Gore Bay. Club Membership fee: $10. Per person, annually.